The Tubular motors are used for Electric roller shutters to move the curtain up or down. These motors are made to the highest quality and are compliant with ISO standards. The customers can choose either switch operation or wireless remote control system and come with 5 years replacement warranty. Prices start from $190 supplied only. This Axle insert fits on one end of the 60 mm Octagonal Axle. Axle insert is an important part of roller shutter as it holds lot of curtain weight.This is highest grade tough plastic axle insert with high end bearing. Spring Fasteners are used to connect the roller shutter curtain to the axle. The high tensile steel spring fasteners are the best available in the market today. This remote can be programmed with most of the Tubular Motors available in market. These have been the most popular remotes available so far. These days customers want ease of use on every product. In-Line Receiver is used to convert standard switch motor into Wireless Remote Control Motor. It can be fitted in the pelmet box or can be left in the roof of the house. All the instructions are provided. At Oz roller shutters, we care about quality. We don't use plastic pulleys. 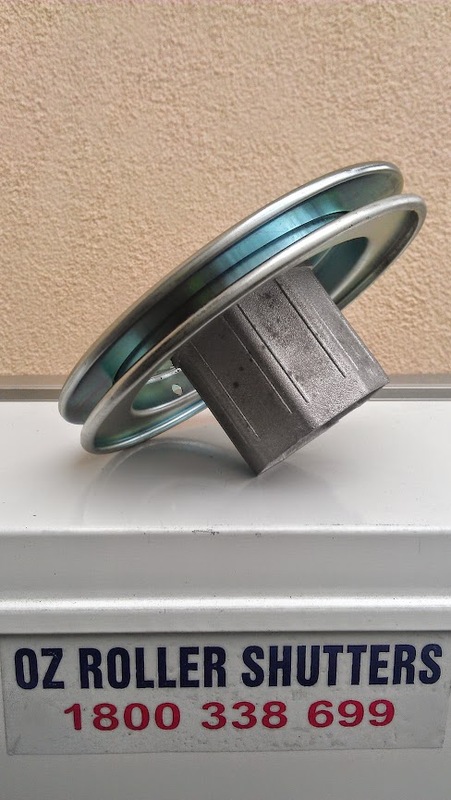 The Pulley we use in manual Roller shutters are all steel for long life trouble free operation. There are different available sizes are 150 & 190 that will fit in 165, 180 & 205 Box. This remote is the most popular with customers. This remote can control up to 16 window roller shutters . It can be used to control all the shutters at one time or customers can choose to operate roller shutters individually via this remote.